Are you planning on finishing the basement of your home? Whether you are designing an all-new basement that was used for storage or remodeling an existing one into a family room, consider waterproofing it. It is essential to understand that basement waterproofing is not a simple task. Water intrusion of any kind in the basement of your home can be disastrous. Therefore, consider contacting a basement waterproofing professional to examine your basement at the first sign of cracks and or leaks. A wet or leaky basement is a matter of significant concern for any homeowner. What might appear to be a slight trickle or leakage can turn out to be a warning sign that might require instant action on your part. Presence of moisture in the basement area of your home can lead to an array of expensive as well as time-consuming repairs. From the formation of toxic molds to structural damage of your house; water in the basement can turn out to be a significant issue. What you need is a basement waterproofing to solve your problem. The question arises, “how does basement waterproofing work?” We will help you discover some of the secrets behind basement waterproofing and what measures to take if you ever need it. What Causes Moisture in the Basement Area? When you wish to understand the importance of keeping your basement dry, it is vital to know what exactly causes moisture. Unfortunately, as homeowners, it is important to note that water has a knack for finding its way into every corner of your home. Because of the unique construction and nature of the basements, the given space is particularly prone to wetness. The ground near the foundation of your home outside should slope away from your home. The slope should not decline towards the home’s foundation. When the slope is faulty, water accumulation occurs around the foundation of the house. It tends to damage the overall structure. When the groundwater and rainwater are not able to drain properly, it can make way into the basement area of your house. Poor drainage systems and weak soil around your home’s foundation are one of the most common causes of wetness in the basement. When the water flow is not directed away from home, it will accumulate around the foundation through which it will flow into the basement’s porous walls and floor. Gutters are assembled to direct rainwater away from the foundation of the house. When the gutters are installed improperly or get clogged due to poor maintenance, water will drain towards the home’s foundation – rather than away from the foundation. Basements are known to be notoriously wet places. In case condensation occurs in your basement, it can lead to the formation of molds, mildew, and cause potential damage to an organic surface. Especially sheetrock and wood. Cracks present on basement floors, walls, ceilings, and around the doors & windows, tend to provide the perfect way through which water could flow into the basement area from the outside. Water always finds the most accessible paths through areas of least resistance, and cracks in the basement serve to be the most natural path for water to get inside. Hydrostatic pressure occurs when water accumulates around the foundation of your house. As gravity tends to push down the water, it tries to escape by releasing pressure. As such, the water forces its way into cracks on basement walls and floor or the area where the wall and floor meet. In fact, due to the build-up of intense pressure, foundation cracks can form along the walls and ceilings of the basement. Do-It-Yourself’ers use quick, simple methods of interior waterproofing when the first sign of a water leak or crack is visible. A temporary solution for interior waterproofing might include making use of coatings and sealants, along with a dehumidifier for preventing condensation in the basement area. Other methods that are usual considerations for interior waterproofing a basement are easy and the most cost-effective ones for homeowners. Existing cracks or holes in the floors, walls, or ceilings of the basement are then sealed and appropriately made watertight. Special sealants are used, such as hydraulic cement, can be utilized for making cracks or holes waterproof. While it is essential to make the interior of your basement waterproof, exterior waterproofing is equally crucial. When it comes to dealing with wet basements, most of the problems usually arise from the outside environment. Therefore, it is necessary to have a look at the outside portion of the basement as well as exterior waterproofing. Exterior waterproofing might require expensive and complicated procedures in comparison to the interior waterproofing. This approach requires unique skillset of laborers to help get useful results. Hiring a contractor with less experience to save some money might cost you bundles of money in the long run. Exterior waterproofing the basement involves excavating the soil that surrounds the foundation of your home. It turns out to be quite a labor-intensive procedure that might require the utilization of large tools & machinery. Once the soil around your home’s foundation has been properly excavated, some form of high-quality waterproof sealant is applied to the exterior walls of your basement. The sealant is usually some polymer-based material that is meant to last for 25 years. In reality, you would be lucky if exterior waterproofing continues to be effective after five years. The loose backfill soil surrounding your home’s foundation will move up and down, side to side as the hydrostatic pressure changes during every rainstorm tearing through the waterproofing layers applied during construction. The breached waterproofing material will be the result of the hydrostatic movement of soil and underground stones. In ideal cases, the process of exterior waterproofing should occur during the original construction of the house. Quickly constructed homes lack adequate protection to fight back groundwater. 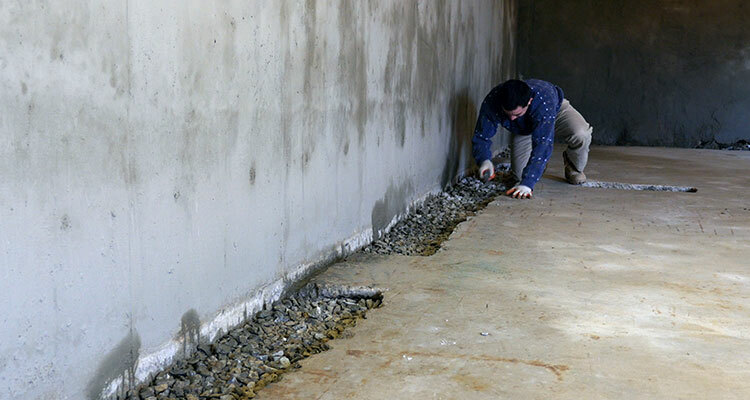 In addition to superficial DIY interior repair and expensive, short-lived exterior waterproofing, an interior drainage waterproofing system is a significant consideration. It may be the smartest and most effective choice out of the three methods. Imagine a waterproofing system that removes water as effectively as an exterior drainage system without the concern of loose, soft soil that surrounds it in the hydrostatic zone, wearing it away. Exterior systems tend to clog with dirt and rocks. There is also a possibility of root intrusion and grading the perimeter again after 8 to 10 years. An interior drainage waterproofing system can manage water under your floor effectively by removing groundwater before it touches your floor. Some systems sold by large franchises manage water at almost floor level defeating the purpose of keeping moisture out and keeping walls and floor dry. Make sure you get a system that manages water in the proper location under your floor. The beauty of it all is that you don’t lose any of your landscaping outside with an exterior excavation project. Most interior waterproofing systems are installed in 2 to 3 days when done correctly. The installation of a sump pump is also as important as the drainage system itself. When installed correctly, it will remove thousands of gallons of water an hour through a discharge pipe that leads to an outside drainage basin. Some basements don’t require a sump pump station if they have drain grates in the center of the basement floor. Those grates have a drainage path below the floor that leads away from the foundation. Sometimes they are not enough to get the groundwater that leaks through the area between walls and floor. It comes down to who is selling you a waterproofing system. Currently, interior basement waterproofing is unregulated, so there are plenty of shady characters out there dying to sell you one. First, do your research before anxiously making a decision. If you want to stop your water problem install a robust system that requires zero maintenance. If it requires maintenance and special flooring you will be paying for your system for the rest of your life. Install the right basement waterproofing system in your basement for the best results. I love what you said about using coating and sealants as a temporary solution for water seepage. However, I think it’s important to call a company that can waterproof your home for years to come. If I had problems with water in a basement, I would contact a contractor that could implement some waterproofing materials. I agree. The article is covering multiple points of view. Simple patch jobs are not going to cut in the long run or, in some cases, in the short term. Mixing hydraulic cement can be inconsistent and ineffective in the hands of a DIY’er. There is no replacement for a professional, certified, trained waterproofer. Basement waterproofing is a serious matter and should be left in the hands of a qualified professional.